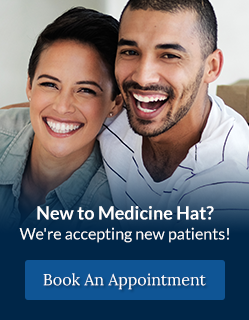 Ask the dentists at River Dental in Medicine Hat, Alberta about TMJ treatment. Temporomandibular Joint Disorder, or TMJ treatment, refers to pain in the jaw joint. TMJ can cause a wide variety of symptoms, from pain in the area of the joint, to headaches, dizziness, difficulty chewing or biting, ear pain, ringing in the ear, and even hearing loss. TMJ can occasionally cause nausea and vomiting and can even cause your jaw to lock open or shut, or make your bite feel unusual or out of place. With a simple examination, our friendly and helpful team can tell you if the symptoms you are experiencing are due to TMJ. TMJ can be caused by trauma to the area, wear and tear over time, or poor habits, such as teeth grinding or clenching. Our kind and caring team can help you to understand if your habits are contributing to your TMJ. Sometimes a simple change in habit can help to improve TMJ symptoms. How will my dentist help my TMJ? Once our knowledgeable team has diagnosed TMJ, there are a variety of treatment options available. Treatment options include coaching you to change any habits that may be worsening your TMJ, preparing a custom-made bite guard, physical therapy, medication, or injections. In rare cases, surgery may be recommended to address the problem. Our caring and experienced team can help you to decide which of these TMJ treatment options are best for you.